I had the pleasure of receiving a collection of goodies from Fancy Pants called "It's Time for Spring" for my latest review. Fancy Pants has been in the scrapping industry since 2005. They started as a home based-business and quickly became one of the leaders in the scrapping world! Their designs are fresh and fun have something for everyone!Be sure to check out their website for ideas, downloads, great inspiration, and a listing of their products! Well this was easy! The prints in this collection are so sweet! I love the graphic designs of the teapots and the very hip hexagons. The colors are so beautiful and are perfect for all kinds of crafting and themes. I love the pastel vibe and the bold prints as well. They offer double sided, thick, paper which I really am a fan of. The collection is completely color coordinated so it's a win-win situation here! The punch out pieces are so cute and go great with the papers. As I stated before this company offers the thick double sided paper which I love. It's great for cards and projects and of course for any layout as well. I like having the option of the two sided paper. The only problem is if you totally love both sides....then you have a hard time choosing! Usefulness: I love the variety of prints, graphics, and the lovely colors of this collection. I think it has a broad range of uses and could be used for many different themes or subjects! What I liked: I love the thick paper. I loved the colors, prints, and graphics. Very sweet and "Springy". Just an all around great quality product! What I didn't like: Nothing. Fancy Pants "It's Time for Spring" collection, Crystal Light container, twine. Fancy Pants "It's Time for Spring" collection, twine. What do you think? Have you used Fancy Pants products before? Have you seen their new collections! We want to hear from you! Leave a comment by midnight EST on Wednesday to be entered to win a prize pack from Fancy Pants Designs! U.S. residents only and please leave a way to contact you if you win. I really love the bold patterns partnered with the light color palette. Thanks for reviewing! Great spring collection. I have used Fancy Pants products and I think they've really stepped it up the last few years and added some great embellishments to their collections! i love this too! wonderful patterns and colors! lots of great uses for it! Loving this line! Great patterns and colors! Thanks for showcasing/reviewing this line-hadn't seen it yet! So on my wish list! Really great projects- thanks for sharing! Cute projects! I really like the pale, but happy colors and the chevron and plaid patterns. Oh, I am a Fancy Pants fan! My LSS finally started carrying it. This line does not disappoint! 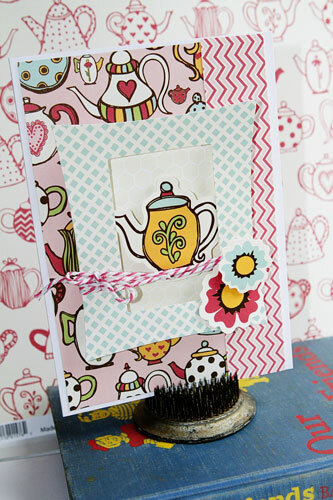 I love using Fancy Pants products in my layouts and cards!!! This line is adorable! I like the hexagons, but the collection as a whole just doesn't appeal to me as much as some of the other new collections. Cute projects! Fancy Pants did it again! Great colors and patterns! I love the muted colors of this collection. Your projects are awesome. Thanks for showing us this line. Fancy Pants is a fave of mine. I love Fancy Pants! This collection looks awesome! This looks like a super fun collection! Love your projects! Fancy Pants has fantastic papers and I love this new collection. It's one of my favorite papers to use for cards and scrapbooks. These look like they would be very versatile. I like the colors and patterns--especially the tea pots. they would come in handy for invitations and decorations. Great collection, it looks versatile for both summer and spring and actually for any occasion too! 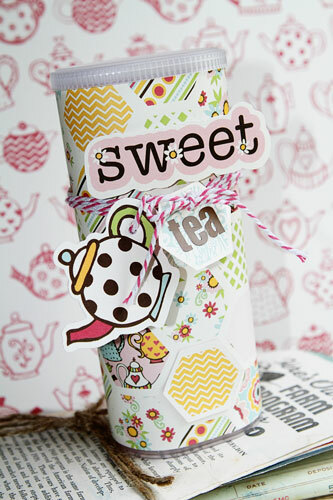 Cute altered container! Loving this new collection! Especially the colors and the hexagon shapes! I have used Fancy Pants before, but I think this new collection is my favorite by far! love the krafty feel to it-thanks for the chance to win! This is SOOO pretty! LOVE the color combo - and the hexagons! I'm definitely having my eye on this collection. Love the color palette. Thanks for the review. I have always liked FP and this line does not disappoint! I love using Fancy Pants products and I think the colors and patterns in this collection are pretty. I LOVE Fancy Pants. They once again make a beautiful line that is versatile enough for me to use with almost any of my pictures! This collection is fabulous!! I love the sweet motifs and the fun colors! 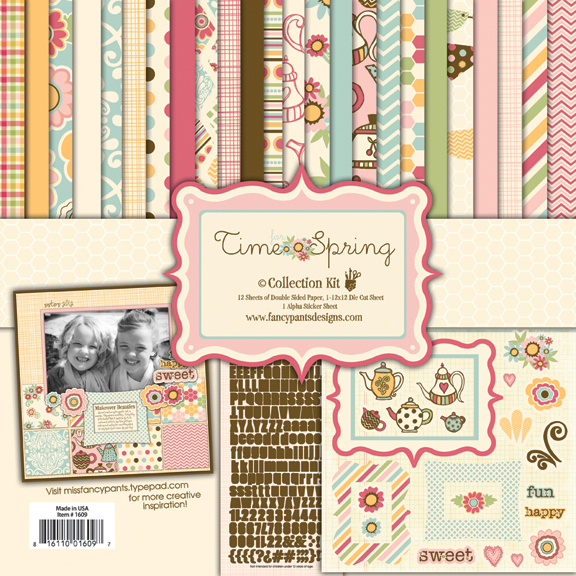 Great for spring and girlie projects! Love the colors and the design! Fancy Pants is always a hit with me!